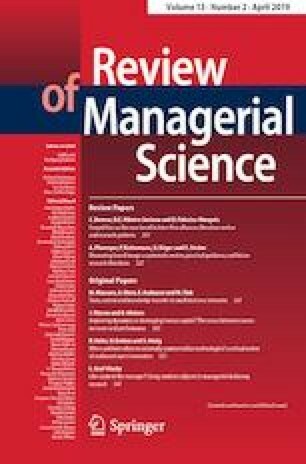 Drawing upon resource-based view and social cognitive theory, this work develops a model that validates the formation of team decision quality and team performance. The model is empirically tested with data obtained from IT professionals across MIS work teams from Taiwan’s banking and insurance industry. The statistical results reveal that team performance is indirectly related to collective efficacy and participatory sense making via the full mediation of team decision quality, while collective efficacy and participatory sense making are directly related to knowledge internalization and resource adequacy. At the same time, the effect of participatory sense making on collective decision quality is negatively moderated by team hypercompetition. Finally, managerial implications and limitations based on the empirical findings are provided. This study was supported by Ministry of Science and Technology, Taiwan. TP1. Our team is very competent in doing jobs. TP2. Our team gets its work done very effectively. TP3. Our team has performed its job well. TP4. Our team results were of high quality. TP5. The continuously of our team improves job efficiency. TDQ4. Our team’s decision contributes to the overall effectiveness of the team. CE1. Our team is confident in correcting the mistakes in the tasks. CE2. Our team is confident in following all of the safety rules on the tasks. CE3. Our team is confident in maintaining its work performance. CE4. Our team is confident in keeping up with the pace of our firm’s development. PSM1. Team members participate in scanning environment for cues that may influence our team. PSM2. Team members participate in effectively detecting potential problems surrounding our team. PSM3. Team members take part in assessing the underlying causes of environmental changes. PSM4. Team members take part in mapping the relationship between relevant surrounding situations and our team’s tasks. PSM5. Team members participate in rapidly figuring out the incidents that may affect our team. KI1.Our team has a unique mastery of its tasks with new knowledge. KI2.Our team can learn what is necessary for new tasks. KI3.Our team can use the information technology to obtain knowledge for the tasks. RA1. We have adequate materials and supplies to do its job. RA2. We have adequate tools and equipment to accomplish its work. RA3. We can get adequate resources to do its job. RA4. We have appropriate access to technical support. RA5. We have sufficient space to execute its tasks. RA6. We have sufficient time to complete the assigned work. TH1. Our team members have a ‘win–lose’ relationship. TH2. Team members’ goals are incompatible with each other. TH3. Team members give high priority to the things they want to accomplish and low priority to the things other team members want to accomplish. TH4. When there is a rivalry between team members, nothing matters to them as long as the means serves the end. TH5. When there is a rivalry between team members, our team members often do whatever it takes to compete against others. TH6. When there is a rivalry between team members, they often show that ‘the end justifies the means’. TH7. The competition among team members often brings on frustration to the entire team.